My tomatoes told me today; if I didn’t use them they were going to go bad soon. Looks like I’m making Pico De Gallo. 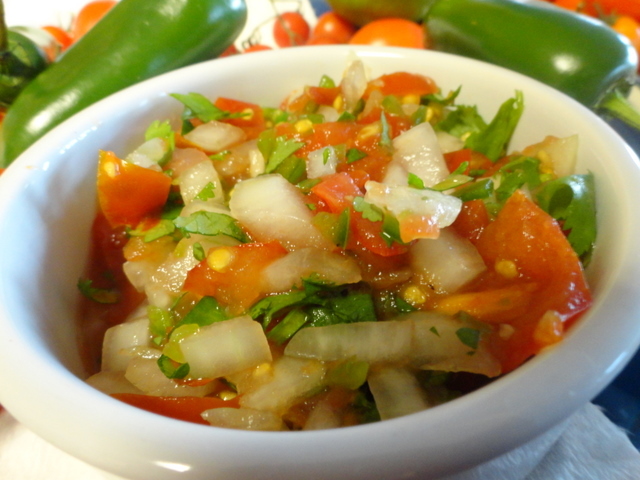 When you’re looking for a Pico De Gallo recipe you need look no further than Antonia; whom, I believe is the world’s foremost Pico De Gallo authority. I used to work with Antonia in a kitchen far, far away from the one I cook in now. Antonia is probably the sternest, most generous, and wisest Mexican, prep cook in the entire nation, if not the world. If you’ve ever worked in a restaurant kitchen you probably are familiar with the family meal, if not here’s how it works. In some restaurants the employees rarely eat from “the menu” instead the kitchen prepares a family meal. By using leftovers, creativity, and technique they produce a meal that the employees share amongst themselves during the down period before the rush. Few if any can make a better family meal than Antonia. Winning! Family meal with Antonia often meant fresh Pico De Gallo! During those years time my beautiful girlfriend became my fiancé and subsequently my beautiful wife. We got married in Mexico so when it was time to cater our reception we turned to Antonia and a couple of days before the big event, while I was at work, my accommodating wife with the assistance of the petite, yet strapping, Antonia made TEN gallons of Pico De Gallo! 5 Pico De Gallons of mild and 5 Pico De Gallons of hot. Combine… The salt together with the acid in the lime will begin to break down the tomatoes almost immediately. However like good chili this Pico De Gallo is better the next day when the flavors have had time to comingle and adapt to their new found friends. Now that you’ve put down the salsa, and picked up a knife I’ve got to tell you… You might not be a chef but you look good with a knife.